In the first four episodes of the season, The Vampire Diaries spent a significant amount of time exploring the shifting character dynamics set in motion by Stefan’s transition into the Ripper. The catch was that he was always a tortured soul reluctantly forced into the role. In one quick moment, however, tonight rendered almost his entire tortured journey thus far completely moot; Stefan, his humanity compelled away in one quick blink of an eye by a vengeful Klaus, is a reluctant Ripper no more. As a self-professed fan of Stefan’s more deviant side, knowing his base instincts will soon be set loose on Mystic Falls is perhaps one of the most exciting things to happen yet. What led up to this moment was a breathless romp of an hour, full of twists and surprises. It all goes down because Klaus has figured out the reason his hybrids aren’t taking is Elena is still mysteriously alive and that Stefan has been keeping this information from him for months. This makes Klaus angry, and I don’t know if you’ve noticed, but an angry Klaus isn’t exactly the kind of guy you want crashing your lighthearted high school hijinks. No, angry Klaus isn’t interested in helping the gang spread honey on doorknobs. Instead, he decides to put a bit of fire under everyone in order to get this hybrid thing figured out by grabbing the only werewolf in sight and transitioning him into a hybrid. That’s right, Tyler is simply a werewolf no more, and Klaus’ ultimatum to Bonnie is she better find out what he can do to make the hybrid transition happen, or else poor Tyler will certainly die like all the others. Here’s where things get tricky: Jeremy is the person who could be most helpful in their quest by asking his ghost vampire girlfriend Anna, but Jeremy is very inconveniently out of the picture having been rudely (okay, hilariously) kidnapped by Katherine for her own purposes (more on this later). Matt, who has been getting signs from Vicki all day that she’s around, even though he cannot see or hear her, decides he can do exactly what Jeremy did to see the ghosts in the first place: die. He then proceeds to drown himself in the pool, because apparently finding out his girlfriend was a vampire has driven him completely insane. It’s a good thing Matt and Bonnie had that conversation earlier in the episode setting up their background as lifeguards so Bonnie could swoop in and give him CPR to save his life, right? While Matt dies for a few minutes, Vicki appears to him and tells him the original witch says the reason the hybrids aren’t working is because the doppelganger is still alive. WHICH WE ALREADY KNOW. So Matt died for nothing? Well, not quite, because now he can see Vicki just like Jeremy can see Anna. This is obviously heading towards an epic Vicki vs. Anna, Matt vs. Jeremy showdown of some sort. It’s nice they gave Matt something to do, but making him a part of the more supernatural world is a bit concerning. We’re only an Alaric away from having no normals left! While Matt was off dying for no reason, Klaus was busy torturing Stefan by using Elena as a bait of sorts. Klaus compels Stefan to feed from Elena, which he fights to the point of almost killing himself. Having been burned by Stefan’s love for her too many times, Klaus finally loses his patience and does the one thing he hasn’t tried yet—compelling Stefan to get rid of every last bit of his humanity and embrace his full Ripper nature. Having solved his little Stefan problem, he turns back to the hybrid issue and realizes the original witch’s message held a hidden clue. It seems she hated Klaus, so she built what she thought was a fail-safe trap into the curse: The doppelganger must die in order to break the curse, but the doppelganger’s blood is necessary to create more hybrids. Lucky for Klaus, Stefan accidentally made this trap easy to get around by keeping Elena alive, and Klaus collects Elena’s blood and feeds it to Tyler, making him a hybrid. Tyler is a hybrid! Oh, this isn’t going to end well. Are you still breathing? Because that isn’t all. While all of this was going down, Damon and Katherine were busy getting their road trip on and kidnapping Jeremy in order to force Anna to give them information about the vampire hunter who is rumored to be the only person who can kill Klaus for good. Anna tells them about Michael and where he can be found but warns them not to wake him because he will “kill them all.” Katherine, of course, laughs in the face of danger, and she and Jeremy immediately go to rouse him from his slumber. I’m sure he will be perfectly pleasant to everyone! 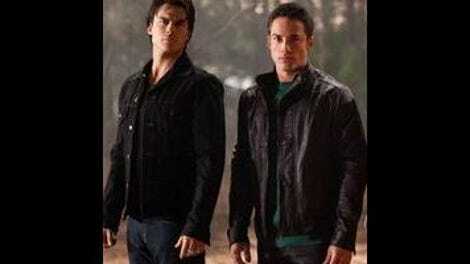 As Michael is coming back to life, in Mystic Falls, things are getting lively as well. Klaus takes off to who knows where holding a bucket of doppelganger blood, but before he goes, he does leave newly humanity-excised Stefan one task: Stay and watch over Elena. When Stefan casually enters the room and busts out a choice bit of snark on the earnest twosome of Damon and Elena, I was overtaken by uncontrollable laughter. The role reversal of Stefan and Damon has been coming for a long while now, but to see it so explicitly demonstrated was delightful. This is going to be fun. Setting “The Reckoning” almost entirely in the high school really brought the insanity of these characters’ lives into sharp focus; high school, for all its highs and lows, is a place riddled with routine. It’s the same classes, same friends, same teachers, day after day until you graduate and never want to set foot inside those halls ever again. To have Caroline strive for normalcy is something this show needs once in a while, and to have that normalcy so thoroughly trounced upon is the perfect metaphor for the show in general. Caroline continues to be the big beating heart at the center of the show, and her quest to just have a normal senior year is adorably naïve, while still hilariously maintaining a somewhat endearingly psychotic “these are memories frozen in time, people!” vibe. On a pure “what does this mean for the future?” level, this was easily the best episode of the season so far. Character dynamics were shifted in ways likely to resonate for the rest of the season, if not beyond. Stefan is truly evil, Tyler is a new hybrid, and Matt can now see his dead vampire sister’s ghost. Any of these elements on their own would be enough for compelling forward momentum, but all three at once signals a significant shift in story focus in the weeks to come. One great thing about The Vampire Diaries is its willingness to let characters truly evolve and transform, while still managing to maintain the core characteristics that defined them in the first place. If any other show suddenly made their romantic lead a psychotic killer, it might be worrisome. With this show, I’m simply happy to be taken along for the ride. We got a timeline mention! Apparently only a year has passed in Mystic Falls. I don’t understand how some of these people are still upright, with all of the mental stress they’ve dealt with in such a short time. Tyler, Tyler, Tyler. Never admit you’re happy. It’s the first step toward sheer doom. Speaking of Tyler, why did Klaus leave his precious hybrid behind while he left town? Isn’t the whole point of him making hybrids having someone to hang out with? Fun party game: Speculate about what Katherine and Jeremy discussed on their trip to raid Michael’s tomb. I’m going with Occupy Wall Street and Ryan Gosling movies. Or maybe weightlifting.